Let’s talk some ups and downs today. 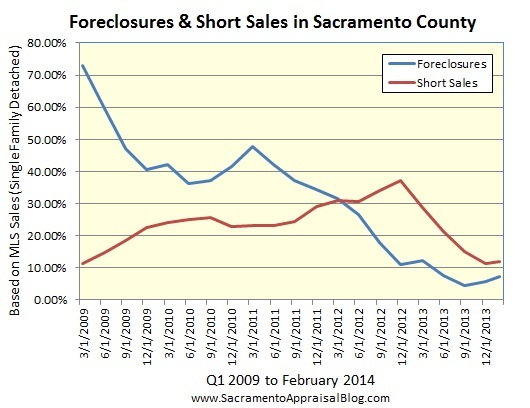 Here is some context to help shed light on how the real estate market is moving in Sacramento. Any thoughts? History of Median Price: This graph shows year-end median sales price figures from 1986 to 2013 in Sacramento County (and West Sacramento). You can see just how steep the increase was last year – even when compared to the heyday of the previous real estate “bubble” that began to burst in 2005. Charts Instead of Graphs: Two weeks ago I shared my big market update post, and I showed how FHA is going up, cash is going down and conventional financing is also increasing. Here is a chart to help give some more specific numbers instead of a graph. After all, some of us are visual people and others simply want the numbers. Goodbye Distressed Sales: Here are some stats on foreclosures and short sales, and it’s always shocking to see how far the market has progressed in recent years. On another note, keep in mind there have historically been far more distressed sales at lower price levels. This is important to realize because when removing so many foreclosures and short sales at the bottom of the market, it naturally gives the median sales price a huge boost. This should bring pause when we quote the median price as rising 20% last year (it definitely did, but since investors devoured the bottom of the market and there were far fewer sales at the bottom, this padded the median price and essentially means not every single property increased in value by 20%). Check out Don’t put all your eggs in the median price basket if you’d like to freshen up understanding the median price. A Juiced Market in 2013: Lastly, I’ve been describing the market as no longer being on steroids, and I’ve found it to be a helpful description for clients and contacts. In 2013 values were “juiced” upward by increased investor activity, historically low interest rates and freakishly low inventory. Now the market has tapered off – just as if it had stopped using steroids. It’s simply a different market than it was last year. Question: What stat stands out to you most? Comments are welcome below.